After having been the home of many civilizations and the scenario of numerous battles throughout the history of Andalusia, old Ronda rests quietly nowadays surrounded by mountain ranges and fertile valleys. At a height of 740 meters above the sea level and only 40 kilometers away from the Mediterranean, it’s one of the most romantic towns in Andalusia. Its unique location on the edge of a dramatic gorge has served as a natural defense for its past settlers. Today it offers stunning peaceful views of the surrounding nature. This tour will take us to enjoy the charm of Moorish Ronda. We will explore the beauty of the old town, stopping to see the gorgeous interiors of a former noble residence. 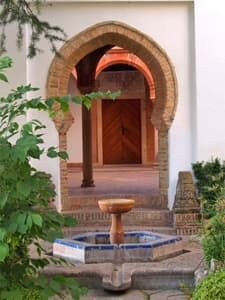 We will also visit the arab baths which are incredibly well preserved. Entering in the former atmospheric hot, warm and cold rooms will allow us to recreate how they worked and how important they were to purify the bodies and souls of the muslims that populated the city before the Christian reconquest in the 15th century. We will have lunch in a family run local restaurant and after some final exploration of the lower part of Ronda, we will drive back. This day trip is ideal for people staying in other locations in Andalusia wishing to visit Ronda in one day. It includes private transportation in a modern and comfortable vehicle with A/C to and from your accommodation. Your personal guide and driver will pick you up in the morning and will drive you back in the late afternoon after spending a great day together discovering the charm of Moorish Ronda. Availability: from Monday to Sunday.